"With 30 hand-drawn blood animations ProBlood Cartoon is a fun easy to use plugin," said Christina Austin - CEO of Pixel Film Studios. ProBlood Cartoon is a package of 30 hand-drawn blood animations made exclusively for use in Final Cut Pro X. Pick and choose from a variety of styles including drips, splats, and more. Easily alter the highlights, midtones, and shadows of animations with color swabs. Users can customize shadow, dof blur, three dimensional rotation, and much more. 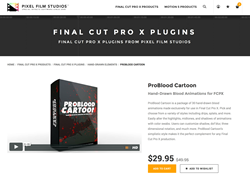 ProBlood Cartoon’s simplistic style makes it the perfect complement for any Final Cut Pro X production. 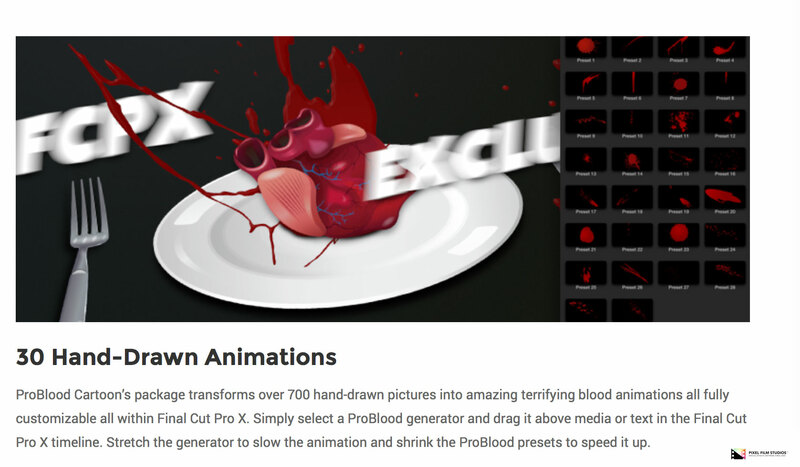 ProBlood Cartoon’s package transforms over 700 hand-drawn pictures into a terrifying blood animations all fully customizable all within Final Cut Pro X. Simply select a ProBlood generator and drag it above media or text in the Final Cut Pro X timeline. Stretch the generator to slow the animation and shrink the ProBlood presets to speed it up. 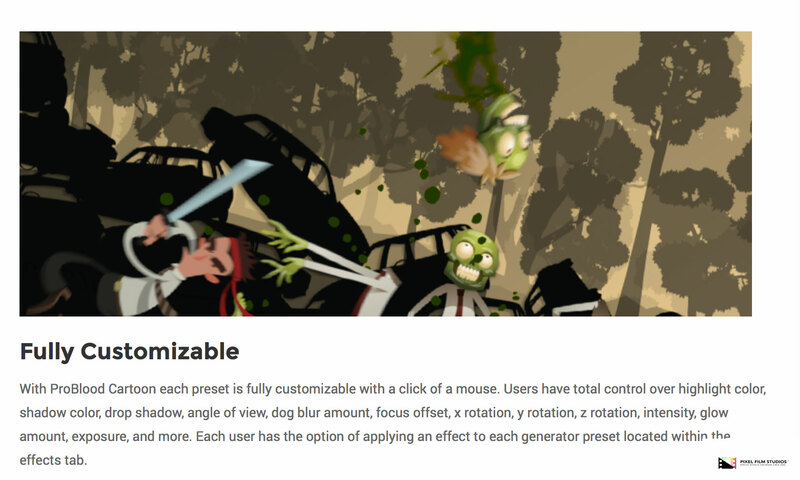 With ProBlood Cartoon each preset is fully customizable with a click of a mouse. Users have total control over highlight color, shadow color, drop shadow, angle of view, dog blur amount, focus offset, x rotation, y rotation, z rotation, intensity, glow amount, exposure, and more. Each user has the option of applying an effect to each generator preset located within the effects tab. ProBlood Cartoon simple and easy to use on-screen controls give each user total control over x rotation, y rotation, z rotation, overall scale, and position. 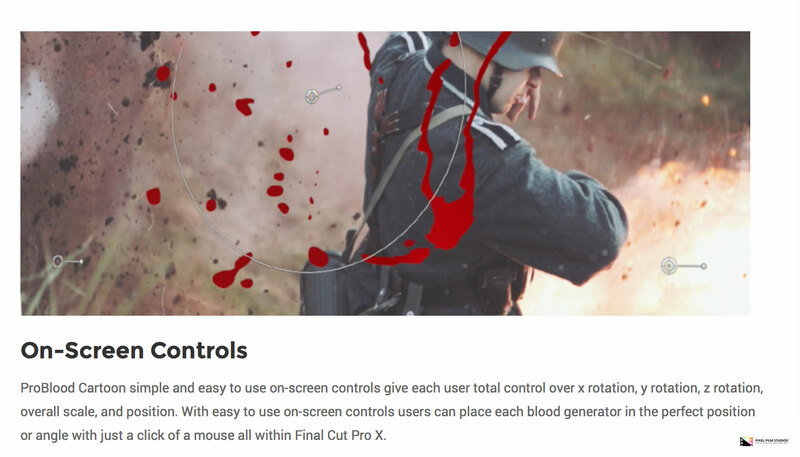 With easy to use on-screen controls users can place each blood generator in the perfect position or angle with just a click of a mouse all within Final Cut Pro X. With ProBlood Cartoon there are 15 effect overlays that users can apply to each preset with a click of a mouse. Each user has the ability to select from applying an aura, bloom, colorization, drop shadow, glint, glow, halftone, hatched screen, highs, indent, inner and outer glow, lens imperfections, line art, line screen, and RGB split. 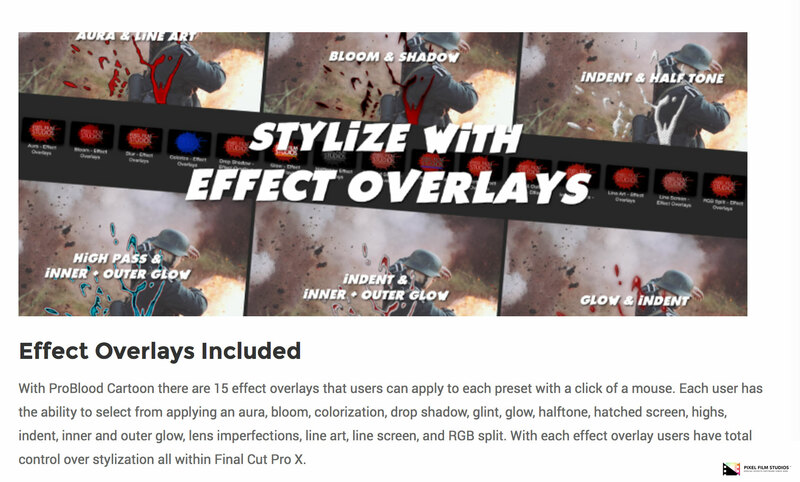 With each effect overlay users have total control over stylization all within FCPX. 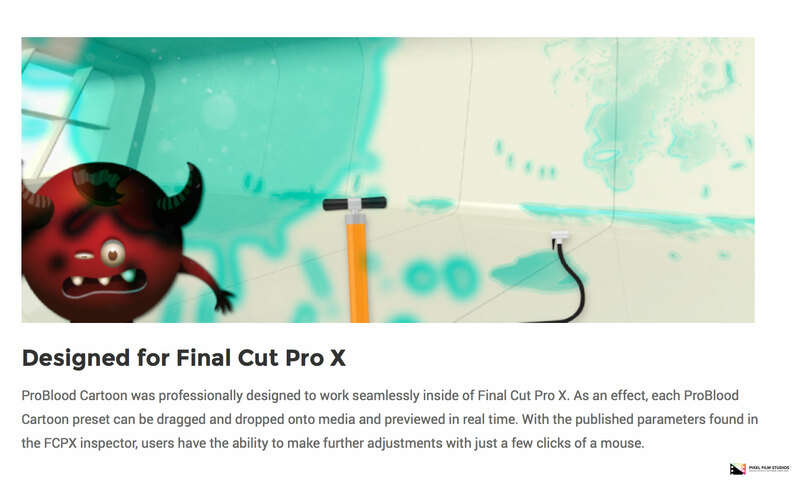 ProBlood Cartoon was professionally designed to work seamlessly inside of Final Cut Pro X. As an effect, each ProBlood Cartoon preset can be dragged and dropped onto media and previewed in real time. With the published parameters found in the FCPX inspector, users have the ability to make further adjustments with just a few clicks of a mouse.